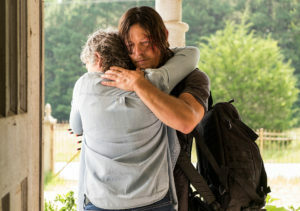 Judging by the many reactions I read between Twitter and Facebook last night, episode 10 “New Best Friends” left many fans of The Walking Dead feeling conflicted. Some based their thumbs-up solely upon the joy of watching Rick battle Winslow, a walker who can best be described as the Mouth of Sauron. Am I the only one who thought that scene was ripped right from Return of the Jedi? Michonne/Leia watching through the hole, Rick/Luke throwing rocks at the seemingly unstoppable Walker/Rancor Monster? haha! Others based their happiness on the long-overdue, yet brief, reunion of Team Caryl. As for everyone else, they mostly flooded social media with questions and complaints. Which, let’s face it, is probably what I’m going to do. First off, need to catch up? 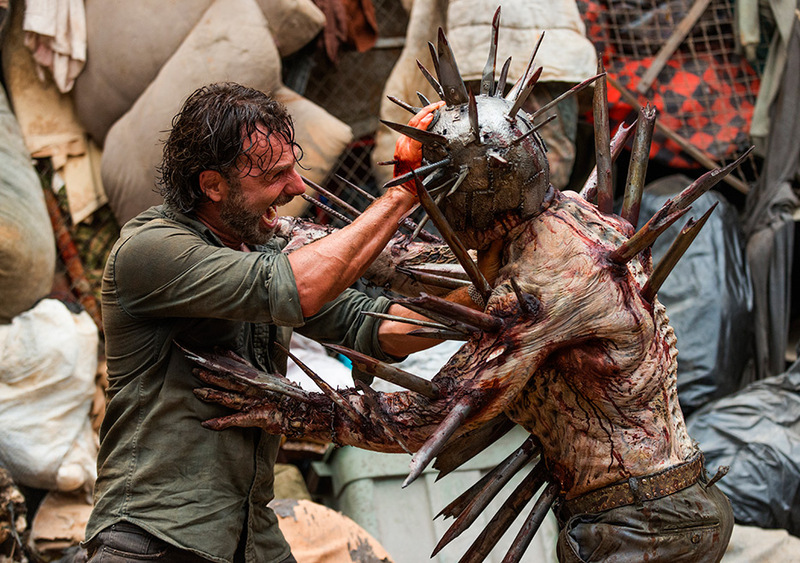 Click Here for a spoiler-filled recap of the episode. I’m going to keep this one short and jump around a tad. But, I promise, all points will be covered tonight. I’ve been invited to be a guest on the Monkey Caviar podcast “Where’s Carl?” tonight at 11pm est. So be sure to tune in live. The link will be available on their Facebook page, as well as ours, later this evening. Anyhow, let’s start with Rosita. As I said last week, I’m completely over her. Rick managed to prove her accusations against Father Gabriel to be wrong (Fake News!). And yet, Rosita still has to behave like a petulant child rather than admit she was wrong, or at least move on as everyone else has done. Denise, may she RIP, tried to make Rosita see that even though she was “…alone, probably for the first time in your life” that in actuality, she was not alone. Family comes in all shapes and sizes and does not end in blood. Rosita is on a one-woman mission to death’s door and she doesn’t seem to care one way or another. Well, honey, if you don’t care, neither do I. See ya. Which brings me to Morgan. If you read the comics (which you should), you would know that Morgan should have been long gone by now. The TV series changed his story, as they have done with many key characters, in order to keep them around. The thing is, Morgan isn’t doing anything at the moment to move the story forward. His character is stuck in moral limbo and I’m going to need him to snap out of it pretty soon. If he hasn’t taken some major steps in the next 2 episodes, my money is on him to die by season’s end. Morgan and Richard, both. 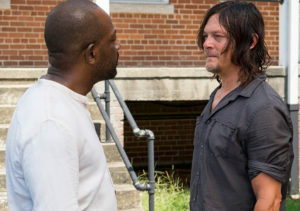 Richard will end up dying in some self-sacrificial way, as recommended by Daryl. The thing with Morgan is that he should have died back at Alexandria during season 6. 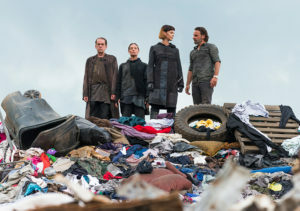 In the comics, the Scavengers are the ones who do battle with Rick, et al, and cause the horde to overrun their safe haven (which results in the deaths of many characters, including Jessie and her family, along with Morgan). The series gave that story arc to a new group called the Wolves. Now, according to show runners, this new group introduced in episode 10 is called the Scavengers (affectionately known amongst the cast as the Heapsters). So, the Wolves got the good story (and were never seen or heard from again, which makes absolutely no sense whatsoever. None. Zero.) and now we have the actual Scavengers and we still have Morgan. You see where I’m going with this? Personally, I enjoyed the Wolves more. They weren’t armed with guns. They were well-spoken. Judas…er…Jadis (wink) and the Scavengers are like fingernails on a chalkboard. Monosyllabic speaking grates my nerves. It seems the apocalypse negated their brain cells. Everything about them is off. And what I see here are two things: 1) a bunch of nameless faces that will die during the war with the Saviors, and 2) a scary female leader to ease us into the idea of Alpha when she eventually appears (and rejuvinates the series the way Negan did). The reunion between Daryl and Carol actually moved me to tears, and also caused some agita. By the way, everyone else has lived in the Kingdom for ages and never questions the comings and goings of Ezekiel, his guards, or the vehicles. Daryl is there overnight and he walks right up to Morgan and calls him out on their Savior drop. I mean…come on. It’s a beautiful soap opera. I know why Daryl lied about Glenn and Abe. I know he wants to protect her. He loves her. Don’t argue it. Embrace it. Richard’s game is to have Carol’s death spurn Ezekiel into action. That ain’t gonna happen. Richard will die (or Benjamin) causing Zeke to step up. One of two things will happen: Carol will end up dying anyway, or Carol and Daryl will die together (as they almost did in Atlanta). Neither character has anything to bring to the story moving past the war. Carol doesn’t exist in the comics at this point and Daryl never existed at all. Would it destroy me to see them go? Absolutely. But it would be good storytelling to have it happen and soon. Both characters have endured their redemption stories, and they have endured. Full character development has been reached. Just please, for the love of all that is holy, let them kiss before they go! As Forrest Gump said, “That’s all I have to say about that.” For now, anyways. Tune in tonight to Where’s Carl? to hear more in-depth thoughts on the entire episode. Also, stay tuned for info about our upcoming relaunch of the Walker Bait Productions podcast Rotter Fodder.